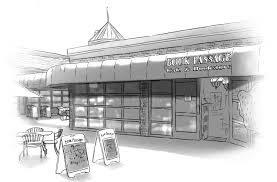 I don’t know who created this lovely drawing of Book Passage in Marin County. But I’d love to give him/her credit. It’s an honor to be reading from Best Travel Writing Volume 9 at the great Book Passagein Corte Madera, California on August 7. With Larry Habegger, Erin Byrne, and Tim Cahill no less.